One of the finest swimming experiences in Texas is at Wimberley’s Blue Hole. It is a spot on the Cypress Creek that I am convinced has to be everyone’s idea of the great swimming hole up in heaven. It was early October, sunny and in the 80s but the park was closed; it was out of season. However, through smart thinking and persistent effort, the organizers of the small conference I was attending had managed to arrange for us participants to be given private access for the afternoon. There were only thirteen of us there and it was as perfect an afternoon as you could ever hope for. But now, as the sun was dipping lower in the sky, it was time for dinner, so I went to my favorite Wimberley restaurant and watering hole, INO’z. 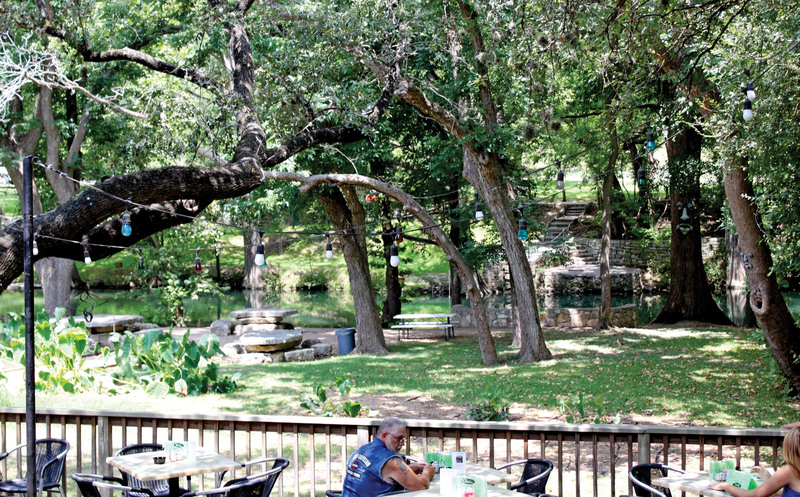 A bit downstream on the creek, in the heart of Wimberley, INO’z has an absolutely magnificent location. The huge outdoor deck sits on a hillside that overlooks parkland with huge trees. Many of the trees have faces. (I’m serious! Some of the shops in Wimberley sell carved wooden mouths, noses and eyes for attachment to tree trunks. Apparently the city has chosen to support local business and add a bit of whimsy to their parks at the same time.) The deeply shaded hillside slopes down to the creek below. In the distance, it glimmers silver in the few patches of sunlight. Only the Chisos Mountain Lodge at Big Bend National Park can rival the view. The beer is cold, the food is good, but it is the view that brings me back every time. He was sitting at the table next to mine and apparently was in a playful mood. He tried the waitress first and she humored him briefly but had other tables to get on to. Then he turned to me. My eye was immediately drawn to his broken front tooth. It was hard not to notice given the way he grinned. I realized he probably was referring to what I call aphorisms, but terminology wasn’t important so I played along. I had to think about it for a while. It wasn’t as easy coming up with these things as you might expect. Eventually, another one came to mind. I wondered what would possess a person to spend time thinking about something this obscure. I’m not shy—or proud. I asked him. He said he worked at the Wimberley Zipline Adventures and that he had lots of downtime spent up on his stand in a tree. Patrons ride down to his station and stop. He unbuckles their harnesses, hooks them up to the next line and then sends them on their way. And then he waits. He described his job as 30 seconds of work followed by ten minutes of sitting. It gave him lots of time to think about a lot of things. I now suspected the broken front tooth might be work-related. He had probably caught an errant body part. This was starting to feel like a game and, being the competitive person I am, I was getting drawn into it. It didn’t look like I was getting that beer. I never really thought about it before that day, but after playing the game with him, the concept stayed on my mind for the next few weeks. After giving it lots of thought, I had no choice but to conclude that he was right. For every one of these sayings, there does indeed seem to be an opposite statement that is equally valid—equally true. That’s an anomaly in our world. The way things usually work is very different. The opposite of a true statement is something that is incorrect—a false statement. If I drop a book, it falls down to the floor. That is a fact and hence, a true statement. Its opposite—that it will fall up—is false. If “he is alive” is true, then “he is not alive” cannot be true. But in the case of truisms, that’s not the way it is at all. So what make these sayings so different? Why do they violate this simple rule of opposites? It took a couple of weeks but I began to suspect there was something else at work here besides the idea of something being true or false. I was beginning to think the essence of this conundrum lies in the fact that there is a difference between something being true and something being a “great truth.” An aphorism, or truism as he called it, isn’t just a fact. It is a short, concise statement of a great truth—a philosophical statement about the rightful working of the universe, what the Buddhists call “dharma.” The opposite of something true is indeed false. But the opposite of a great truth is often another great truth. As a result, truisms standing alone are really only half-truths. In order to capture the whole truth of reality, they always need to be paired with their opposites. It is simply a case of Yin and Yang. That is one of the fascinating mysteries of the universe we live in and that is the idea this guy had somehow hit on. It was beginning to look like I was going to lose this game. My beer was close to empty and it was time to order another. That meant we had to determine once and for all who would be paying for it. I decided to give it one last try. But he bought me that beer anyway.